Dozens of Israeli flags were desecrated in Jaffa overnight Wednesday. It's not clear who is behind the vandalism, police said. Dozens of Israeli flags were desecrated in Jaffa overnight Wednesday. 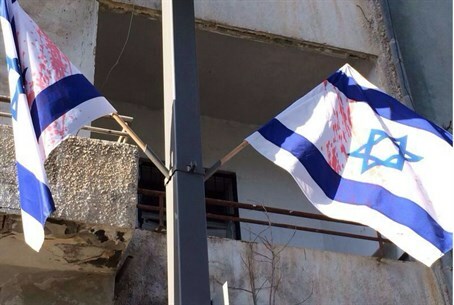 The flags, which had been hung by the Tel Aviv municipality in honor of the upcoming Israel Independence Day holiday, were marred by red splotches. The flags had been flying on the main streets of the city, including Jerusalem Boulevard. The vandalism was noticed by passerby in the early morning hours of Thursday. Police arrived on the scene and opened an investigation. No arrests have been made yet. Police did not say what the motivation might have been, but police sources said there were likely two possibilities. Local Arabs, the sources said, may have committed the vandalism as a “price tag” attack, damaging city property to show their hatred of the state. The sources added that the fact that the flags were colored in red – a color associated with socialists and Communists – could be a clue that the vandalism may have been carried out by radical leftist and anarchist groups who took the opportunity of May Day, the socialist-inspired international workers' solidarity day, to protest against Israeli economic and government institutions.